Pseudomyxoma peritonei is a rare condition consisting of mucinous ascites, most commonly arising from mucinous tumors of the appendix and occasionally from the ovary. Very rarely mucinous implants arise in the retroperitoneum without any intra-peritoneal involvement. This has been termed as pseudomyxoma extraperitonei. We report a case of a 57 year old man who developed pseudomyxoma extraperitonei, 35 years after undergoing an appendicectomy for a perforated appendix. Pseudomyxoma extraperitonei has been previously reported, however we report the longest incubation period of 35 years for this condition. 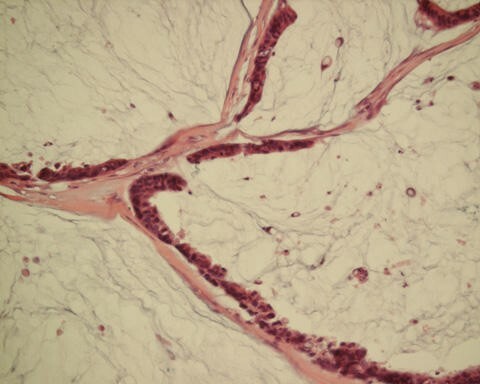 We report a case of pseudomyxoma extraperitonei associated with mucinous adenocarcinoma in a patient who had an appendicectomy performed 35 years previously. This is the longest interval reported between appendicectomy and diagnosis of pseudomyxoma extraperitonei. A 57 years old Caucasian male was referred to the surgical clinic with vague lower abdominal pain. He had no systemic or bowel symptoms. Abdominal examination revealed a large, fixed mass in the right iliac fossa. The only significant past history was an appendicectomy 35 years ago, in March 1966, when he presented with abdominal pain, fever and vomiting. On examination he was found to have a mass in the right iliac fossa. A diagnosis of an appendicular mass was made and he underwent an interval appendicectomy a few weeks later. At operation a high retro-caecal perforated appendix was seen and the operation to remove the appendix was "difficult" necessitating an extension of the 'grid-iron' incision and insertion of a drain. Postoperatively he developed cellulites and a cutaneous fistula, which subsequently closed. He had remained well and symptom free thereafter until the current presentation. In spite of an extensive search for his past records the histology of the appendix was unavailable. At present his routine hematological and biochemical tests were within normal limits. 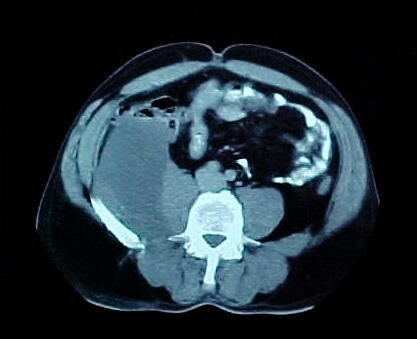 A computed tomographic (CT) scan of the chest and abdomen showed a well-defined mass with low attenuation measuring 11 × 6 cm on the right side of the abdomen, extending from the level of the renal hilum to the anterior superior iliac spine. It was closely related to, and distorting, the right psoas muscle. The mass had displaced the ascending colon anteriorly (Figure 1). A CT guided aspiration of the mass yielded mucin and degenerate cellular debris. Computed tomographic scan of the abdomen showing the mass to be closely related to the right psoas muscle and displacing the colon anteriorly. At exploratory laparotomy, an encapsulated large mass extending from the right 12th rib to the right lateral pelvic wall was excised intact. It was free from all surrounding structures, including pancreas, kidneys and bowel. The mass was attached to a 2 cm area on the anterior aspect of the quadratus lumborum muscle. On gross examination the specimen consisted of a partly solid and partly cystic mass measuring 17 × 11 × 6 cm. The cut surface showed myxoid change with areas of necrosis, hemorrhage and calcification. On microscopic examination there was extensive infiltration of the skeletal muscle and fatty tissue by a mucinous adenocarcinoma. Pools of mucin were seen lined by malignant epithelium (Figure 2). There were areas of inflammation; fibrosis, calcification and cholesterol cleft formation. Photomicrograph showing pools of mucin lined by malignant glandular epithelium. (Hematoxylin & Eosin, ×10). The patient was treated with adjuvant radiotherapy (40 Gy in 20 fractions) and chemotherapy (weekly injections of 5-fluorouracil and folinic acid given for 30 weeks) making an uneventful recovery. At follow-up three years later there was no sign of recurrence. This unusual case of pseudomyxoma extraperitonei is the tenth reported in the English literature. In this case, a large mucinous adenocarcinoma was attached to a tiny area of the quadratus lumborum muscle, without any involvement of neighboring structures. Werth  in 1884 first described pseudomyxoma peritonei as characterized by the presence of mucinous and gelatinous material in the peritoneal cavity. Earlier hypothesis of the etiology included an inflammatory response with peritoneal metaplasia  and active secretions by peritoneal metastases [2, 12, 13]. Some authors use the term pseudomyxoma peritonei only when mucinous ascites is caused by benign peritoneal deposits and metastatic mucinous adenocarcinoma, when malignant cells are identified in the mucinous material [7, 10]. Others however, consider all pseudomyxoma peritonei to be low-grade mucinous adenocarcinoma [1, 10]. More recently, Ronnett et al,  have suggested a classification based on tumor pathology where they place all pseudomyxoma peritonei in three groups in order of decreasing prognosis: disseminated peritoneal adenomucinosis (DPAM), peritoneal mucinous carcinoma with intermediate or discordant features (PMCA-I/D) and peritoneal mucinous carcinoma (PMCA) . In 1948 Bonann  reported pseudomyxoma involving only the retroperitoneum. This was later termed as pseudomyxoma extraperitonei by Moran  in 1988. In eight of the nine case reports of pseudomyxoma extraperitonei the cause was a rupture of an appendiceal mucinous tumor into the retroperitoneum (Table 1). In one, information regarding status of the appendix was not available as the appendicectomy was performed several years previously. An inflammatory response to the mucin leads to fibrosis and encapsulation limiting it to the retroperitoneum. Several treatment modalities with radiotherapy and chemotherapy have been used in treating pseudomyxoma peritonei with varying degrees of success. Recently, Sugarbaker et al,  have advocated radical surgery together with perioperative intra-peritoneal and systemic chemotherapy. The reported 5-year survival rate of patients with pseudomyxoma peritonei varies from 11% to 75% (mean 50%) . The role of adjuvant treatment in pseudomyxoma extraperitonei and the survival rates are not known due to the paucity of the reported cases. The prognosis however, is likely to be better than pseudomyxoma peritonei as the vital abdominal structures are not involved . Mucinous implants in the peritoneal cavity are almost always of appendiceal or ovarian origin . Unusual sources of mucinous adenocarcinoma causing pseudomyxoma peritonei have included colon, uterus, common bile duct, pancreas and the stomach . However, a recent report by van Ruth et al,  suggests that the appendix is the primary source of most pseudomyxoma peritonei, which may then spread to other sites like the ovaries. In the absence of any other precipitating cause it seems likely that pseudomyxoma extraperitonei had originated from the perforated appendix in this patient 35 years ago. It appears that a perforation of an appendix containing a mucinous tumor leads to pseudomyxoma and therefore the authors recommend, wherever possible, complete removal of the appendix at appendicectomy and thorough cleansing of the surrounding areas to prevent the occurrence this serious long-term complication. It is recommended that in an encapsulated pseudomyxoma extraperitonei it is imperative that an intact and complete removal of the mass is achieved without spillage of the mucinous contents in the peritoneum to prevent intraperitoneal extension of the disease. MHS collated the information, searched literature and wrote the manuscript. NA assisted in literature search and writing of the manuscript. ZK contributed to the pathological aspect of the manuscript. MCP managed the patient and helped in preparing the manuscript and edited the final version.